The red dragon flowerhorn fish is perhaps the most popular and easily available Lou Han ever produced. These fish are relatively easier to keep and enhance in comparison with the other strains making it perfect to first-time fish keepers. Most red dragon flowerhorns during the early days of this strain did not have large nuchal humps and excellent pearl markings, but recent improvements done to this popular strain are quite impressive. I have yet to find a literature fully disclosing the details about the origin of red dragon flowerhorns but many believe that the first ones came out of Malaysia. The strain would soon spread in Singapore and Indonesia, then to other neighboring Asian countries as well as in the USA. In the early years of the Lou Han, this type of flowerhorn was a big hit because many Singaporeans are descendants of Chinese immigrants who believe that its red coloration brings luck to their families and businesses. This Lou Han also became very popular among other Asian countries especially among those who believe in Feng Shui, the dragon being one of its revered mystical creatures. While it’s interesting to find out how and where this type of flowerhorn first came about, it’s also important to note that red dragon flowerhorns have already been widely crossbred which enhanced ideal traits like head growth, pearling, body, tail, and markings. Many experienced hobbyists agree that flowerhorns today are largely cross-bred and classification through bloodlines does not hold as much weight as before. Many believe that a fish should be classified by its appearance and not by the strain its breeder reports. Personally, I would classify a flowerhorn as red dragon if it is predominantly composed of Zen Zhou characteristics and if a considerable portion of its body is covered with deep red coloration. While we all would prefer those with large kok, short body, and excellent pearling, these traits may not necessarily be present for a flowerhorn cichlid to be considered a red dragon. In the early years of Lou Hans when most strains were greens and yellows, you can just imagine how popular this strain should have been when it came out. While it’s no longer as popular as it used to be, this strain has always managed to make a comeback. Being widely popular among Feng Shui practitioners, these strain appeals a lot to newbies. It’s also true that many seasoned hobbyists love keeping this type of Zen Zhou. Being a Zen Zhou, it is quite easy to breed them so they should cost less compared to the more rare strains. 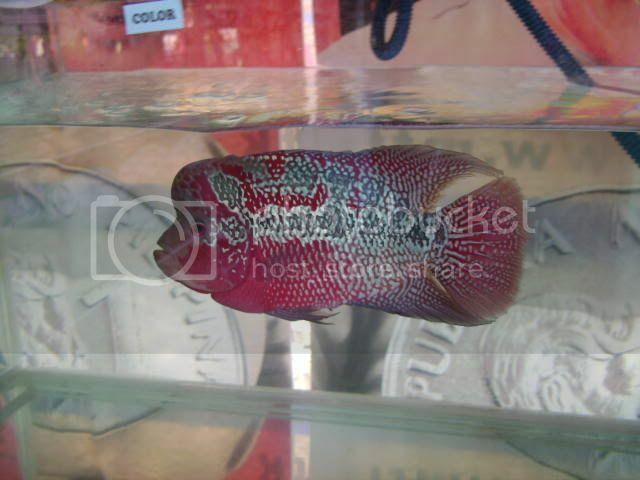 Further, the red dragon flowerhorn price largely depends on the traits the fish possesses. A fully-grown fish with redness spreading back to its tail, fully-developed head, intricate and defined pearl markings, dark and defined line marks in both sides, and good body form should command a really high price as these ones don’t come often. Red dragons will continually be bred and enhanced to produce better ones for sure. Although this strain has already evolved a lot since the introduction of the classic counterparts, breeders will still strive to make it even better. The Red Phoenix that became widely popular here in the Philippines in the last decade is said to be a mix of the Phoenix Strain and this strain. While the Red Phoenix has already lost much of its glory, the Red Dragon still persists to be one of the most loved types of flowerhorn.